If your steampunk Iron Man costume is sadly lacking that authentic je ne sais quoi, you could always track down this Victorian-era anti-wanking device. (Note the helpful urine colander.) Yes, it was designed for teens and is shudder-inducing in every single way, but nobody said crime-fighting was a vacation. The rare 19th century item is made of copper and was designed to be worn by boys so they could not commit the 'sin'. Attached to a belt it would have encased the genitalia. 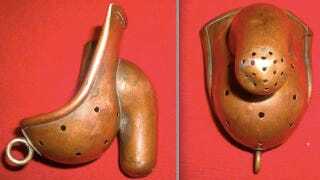 The bizarre antique dates back to around 1880 and was used in Catholic France. Related: Slightly more comfortable old-school armor and an overly elaborate device to prevent your horses from masturbating. Can you guess what these terrifying 19th century inventions were used for?